Native Pulse is a two-person music production company designed to help artists see their creative vision from concept to conclusion. 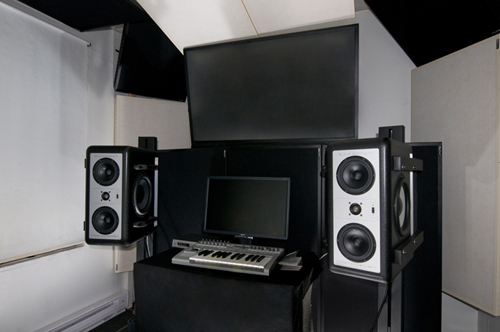 Our in-house recording studio has hosted many artists from around the world as well as the Boston area. Located in Quincy, we're walking distance from Quincy Center. Globally renowned drummer and composer Ra Kalam Bob Moses has over 30 years experience writing, arranging and producing albums for artists of all genres. Live and in the studio, Ra Kalam has performed both as a leader and as a side man with some of the worlds most respected musicians. If you are in need creative direction, musical accompaniment or anything in between, Ra Kalam is your man. David J. Sullivan has been recording music for more than 15 years, and has become Ra Kalam Bob Moses' chief audio, mixing, editing and programing engineer. He specializes in both studio and location recording with experience in jazz, reggae, hip hop, electronic, metal, world music and more. If you are in need of an exceptional sounding record, don't hesitate to contact him. The Quincy space, located at 11 Carruth Street in Quincy, MA, is a 15 minute walk from the Red Line and a 20 minute drive south of Boston. Here, we can facilitate small ensembles, singer/songwriters, lyricists, voiceover artists and anyone wishing to work with Ra Kalam Bob Moses. 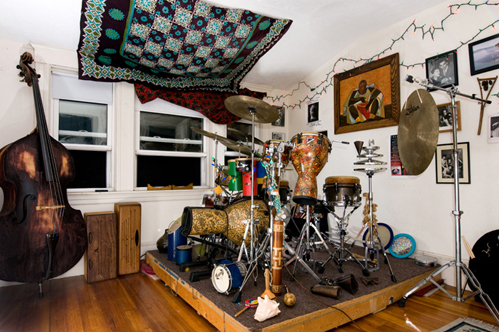 This studio houses Ra-Kalam's infamous drum set which never leaves the premises. Check it out here. The backbone of our studio is our clients. They keep Native Pulse alive. During sessions our clients have been gracious enough to let me take photographs. Here are a few recent ones that I have taken, please check back often for updates. The legendary Dave Liebman came by the house last week to record some horn for the Edgar Bateman date. We are very excited about this! Allan Chase came by the studio in 2016 to do a duo record with Ra Kalam. What has since become known as Shamanic Soliloquies! An outstanding, creative, forward reaching album. Very fun to work on, and more fun to listen to. Definitely check it out! Chair of the Ear Training department at Berklee since 2008, saxophonist and composer Allan Chase has appeared as a soloist on over 40 jazz, pop, and classical recordings, in addition to several movie scores. Chase has taught a wide range of college courses in ear training, transcription and analysis, harmony, counterpoint, music theory, and music history, as well as ensembles and private lessons. He began his teaching career at Berklee in 1981, and has also taught at Tufts University and New England Conservatory, where he served as chair of jazz studies and dean of the faculty. From 1992 to 2000, he performed and recorded with John Coltrane's former drummer Rashied Ali, and he has been a member of Your Neighborhood Saxophone Quartet since 1981. The prolific guitarist and composer Henry Kaiser approached Ra Kalam about doing a recording here with his group Plane Crash. He brought in Vinny Golia on horns, Damon Smith on bass and Weasel Walter on drums for a quintet with Ra Kalam also on drums. The results are an astounding, dynamic full-length recording with a 12-page booklet of paintings by legendary artist Jordan Belson, titled Astral Plane Crash! This is really an all star group. For full bio’s, see links! David Eure currently teaches jazz violin at the New England Conservatory Preparatory School and School of Continuing Education. Eure bridges the classical and jazz divide, and following his work with jazz pianist Yasko Kubota, Eure continues to explore African and Latin American cultural roots. Eure has performed concerts with Yusef Lateef, Wayne Newton, Yasko Kubota, Aaron Goldberg, Burt Teague, Jimi Bell, Richard Doron Johnson, Avi Rothbard, Carlos del Pino, Jorge Najarro, Osmany Paredes, Gary Valente, Cecil McBee, George Russell Jr., Kim Trusty, Frank Wilkins, Joan Watson-Jones, and Christine Correa. He did a solo performance for President Bill Clinton. His performance history also includes masterclasses with Harry Connick Jr., performances at the Norfolk Chamber Music Festival, Contemporary composers (as a member of the New Bohemian String Quartet), the New England Fiddle Contest and the Hartland Folk Festival. He has performed with Rick Danko, Taj Mahal, Richie Havens, and has opened for Kirk Whalum and Alex Bugnon. He continues to perform and record locally. Tenor saxophonist, Jerry Bergonzi, is an internationally recognized jazz performer, composer, author and educator. His music is renowned for its innovation, mastery, and integrity. Relentless drive, inner fire, total command, awesome technique, elastic lyricism, rich resonance, world-class, a musical visionary, are among the rave reviews credited to his sound. Bergonzi's music has been applauded throughout the world at festivals, concert halls, and jazz venues and his dedication to jazz music has been well documented by an extensive discography of over 150 sides. Born in Boston, Massachusetts, Bergonzi became interested in music early on.... During 1972 and 1978 Bergonzi lived in New York City and experienced what he considers his real college education. There, where he had a third floor loft and friend and bass player, Rick Kilburn, lived on the first floor, was the scene of many sessions. "Often, there was one drummer, one bass player, and five saxophone players!" Bergonzi remembers. "Sometimes I was the drummer, each guy would tell a friend, everyone was hungry to play and it was great experience." Joe Lovano, Steve Slagle, Billy Drewes, Paul Moen, Pat LaBarbera, Dave Liebman, John Scofield. Mike Brecker, Bob Berg, Tom Harrell, Steve Grossman, and Victor Lewis were a few of the many players who came to play. Pioneering Afro-Beat and Acid-Jazz legend Bukky Leo was in town from London, England to purchase a saxophone from our good friend, musician, and horn dealer Jim Warshauer. What better way to try out the new instrument than to make a record at Native Pulse? We invited Jim and trumpeter Vivek Patel to the party and captured a three-day marathon which has just been released as Spaceships over Africa! I came up with the idea to Record at New England Conservatory's Jordan Hall. The sound in that building is simply exquisite. Ra kalam made the phone call, and they went along with it. We asked Dave Liebman if he was interested, and he said “Yes”! What we got was a fantastic recording in a fantastic room. Thank you to Dave Liebman and the staff at NEC for letting us use their space! Music from a Parallel Dimension. We have a wide variety of drum and percussion instruments, including Remo djembes, ocean drums, spring drums, concert bass drums, cuikas, cluster drums, snare drums, tom toms, Zildjian gongs and cymbals, rain sticks, crazy mallets, etc. We have an asortent of string instruments including a stand up bass and our in-house piano. We also have access, through Bob Moses’ life work, to the finest musicians of any instrument in any style. Our mixing facility has been treated exclusively with realtraps® high-performance acoustic treatment for maximum room frequency balance and accurate monitoring. "The MicroMain27 is a groundbreaking new monitor that is in a class all its own. It is quickly becoming the premier choice for top mixing and mastering engineers. The speaker is designed to address the demands of modern recording. It breaks down the barriers between nearfield, mastering and main monitors. 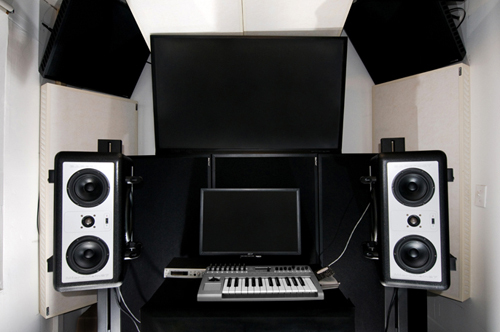 No need to have multiple pairs of speakers crowding your studio; no need to guess what the mastering engineer is going to hear. The MM27 is compact and powerful, truly a "nearfield on steroids™." While exceptionally neutral and designed for critical listening, the MM27 is still very capable of rocking the house. It transforms the definition of a main monitor -- a Micro Main™ monitor. The only monitor you may ever need."